We've had a varied week, Sky-wise, this week. This is an upshot, of one of my white roses, on a clear day, with wispy clouds. Very unique angle. Love it! Clear blue sky & such pretty flowers! The contrast of white and blue is endearing. I like this shot. I love white flowers of all kinds so I just had to come and visit. 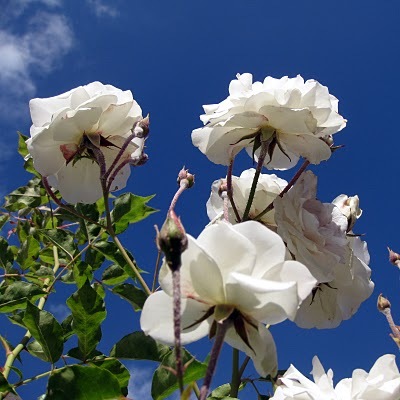 These white roses are wonderful, especially against the bright blue sky. Thank you for sharing them with us. The roses look like puffy white clouds! beautimus. beautiful skywatch today, i love the upward view and the contrast to the blue sky. Gorgeous skywatch shot. The blossoms and the sky is just lovely!